http://www.visitmorningtonpeninsula.org/ is a pretty good start for figuring out other stuff to see and do on the Peninsula. http://www.visitmorningtonpeninsula.org/ has an accommodation booking facility. Mornington Peninsula Shire Foreshore Camping stretches along the bay side of the Peninsula. Sections 4 and 5 (McCrae) are fairly close to the Dromana start line. Shire moves the pages of their website around a bit, but that link should at least get you to their main site. Surf from there. Marshall's Holiday Rentals. Mornington Peninsula Accommodation. Minimum stay is 3 nights. 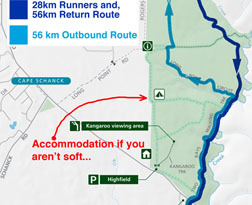 If you're really stuck, or you can deal with no-facilities camping then you can arrange to camp in the Mornington Peninsula National Park in the Greens Bush area shown in the picture to the right. Phone Parks Victoria about this option 13 1963.
http://www.fapas.com.au/home The Frankston & Peninsula Airport Shuttle will get you to Dromana from Tullamarine airport. http://peninsulataxis.com/ Mixed reports regarding service. See the "Entrant Info Book" section of the site about race day buses for 28km runners.